If you have a square room (not too narrow); the square dining table would look as good as round table for the room. Unlike oval dining tables; the square dining tables have all sides equal. The bigger the table; more people can be accommodated with comfort. So, if there are six people on each side; this makes 24 guests getting served by you. There are square tables available with leaf so you can extend these to rectangular. The downside of the table is; it makes conversation bit complicated when there are more people as you are sitting in the direction of looking one another, and therefore smaller square tables would be better. This article is about top 10 square dining tables in 2018 including pros and cons of these. Whether it is glass or wooden, square dining table; both kinds of tables are suitable for different types of rooms. As you have your priorities to select the right dining table; there are some pros and cons to help you understand whether or not it is a suitable dining table for you. If you want to keep the room bright; the glass dining tables would be suitable because of their reflective features. Modern glass dining tables are made by using tampered glass or other durable material, making these strong. As glass table is good choice but it still is hard to clean those handprints or fingerprints. Not only that; even the small marks can become visible on the glass table. The wooden, square dining table gives your room a natural look. Modern wood dining tables are available in many designs. In wooden dining tables; the table design is not the only thing to consider. The wood should be durable too, such as mahogany and oak are famous materials to last long. Another good thing about wood is the fingerprint marks do not matter as mostly these aren’t even visible on these. This doesn’t mean you do not have to clean the wood tables; these also need to be cleaned. Grace you dinette, kitchen or dining room with this gorgeous Stockport Counter Height Dining Table. Counter height makes it an excellent choice for both restaurants and pubs. Match this stunning table with stylish, sturdy and comfortable chairs (sold separately). One of the best from Stockport Counter Height Dining Table collection. Available in both classy Mahogany finish; and Buttermilk and Cherry finish. Counter height table is perfect choice for your kitchen or restaurants. 1 ✓ The table fits in the kitchen easily. ✘ Some people complain it was too heavy and didn't like the way it was packed. 2 ✓ Some people think it is a heavy table yet inexpensive. ✘ Some people said the table had some scratches and marks. 3 ✓ The table can be assembled within 30 minutes. 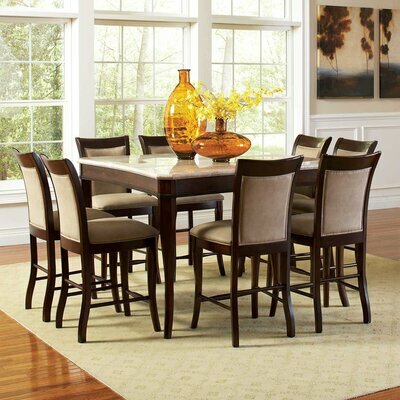 The appealing Auburn Road 5 Piece Dining Set with 4 Saddle Seat Stools is an ideal choice for your kitchen, dinette, and dining room or even bar area to enhance its decorum. This antique walnut finish table is made from solid pine wood for optimal strength and endurance. You can pair this gorgeous table with matching saddle seat stools. Best from Red Barrel Studio Dining collection. 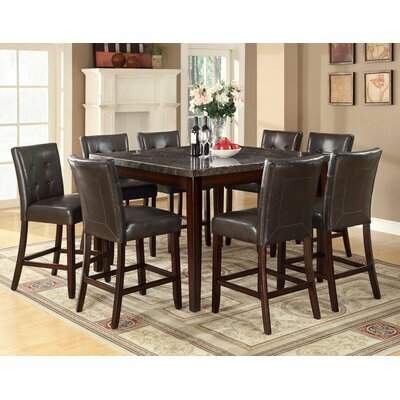 Dining set includes table with 4 saddle seat stools. Appealing Antique Walnut finish table. 1 ✓ The table fits even in small kitchen. ✘ Some people are not satisfied by the quality. 2 ✓ It can be assembled by following the instructions. 3 ✓ Many people are satisfied by the speed it is arrived to them. 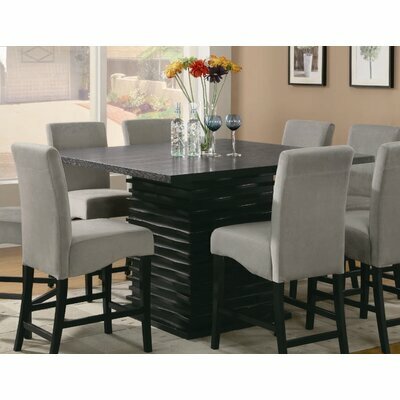 Welcome home your guest and impress them with this trendy yet classy Bob Counter Height Dining Table graced with slick Black finish. Sturdy solid wood combined with appealing unique design will surely enhance the beauty of your kitchen, dinette or dining room. One of the best from Bob Dining Table collection. 1 ✓ Some people loved the table top. ✘ Some people have complained about stains on the table top. 2 ✓ Some people have liked its modern design. ✘ Some people have said the shipping of the table was slow. 3 ✓ The table can be assembled by following its simple instructions. These easy on your wallet, mid-century replica of originally famous café tables from quaint bistros of France are sure to give your dining room a touch of nostalgia with true vintage feel. One of the best from Durango collection. Classic French style café dining table. Available in wide spectrum of colors. UV resistant, sturdy steel construction. 1 ✓ The table works great even in small areas. ✘ Some people find it expensive and have complained it was hard to assemble. 2 ✓ Some people have liked its durability. ✘ Some people think it is small than expected. 3 ✓ Many people think it is a good table for outdoors too. Stunning marble table top, trendy cut-out back center chairs and appealing contrast of black finish table base and crème table top is what you exactly need to create a rich and stunning focal point in your dining room. Pair this classy beauty with white or black bi-cast vinyl back center cut-out chairs. Crème/tan faux marble table top. 1 ✓ Some people liked the design and think it is easy to assemble table. ✘ Some people didn't like the quality. Comfortable, functional and aesthetically pleasing Cincinnati Counter Height Dining Table features real marble table top with Cappuccino finish base which is equally appropriate for your kitchen, dining room or dinette. 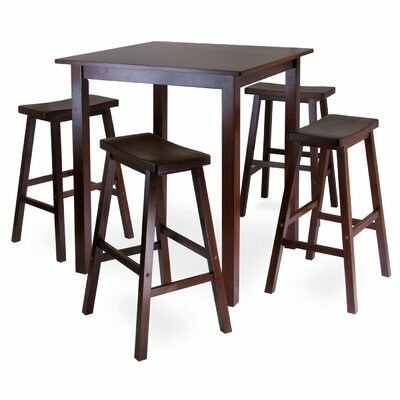 Complete the dining set with casual and comfortable upholstered bar stools for excellent dining experience. Square shaped table with tapered legs. 1 ✓ Some people think it was easy to assemble and liked the quality. ✘ No cons have been found yet. 2 ✓ Some people said it can be a great table if the chairs are right size. Two toned casually elegant Morrison Dining Table is an ideal choice to create a cozy and comfortable corner in your beautiful kitchen or dining room to enjoy intriguing coffee conversation or morning breakfast with newspaper. One of the best from Morrison collection. Turned legs with smooth edges and base. Unique design with 9 tiles on table top. Smooth natural wood frame with round edges. 1 ✓ It is a great table for small kitchens. ✘ Some people have complained the table wasn't arrived in good condition. 2 ✓ Some people think it is small and good breakfast table and it has beautiful color. Traditional and casual look combined in this classy Counter Height Dining table is sure to give you best dining experience. Match your marble table with sturdy and comfortable chairs. Swenson Counter Height Dining collection. Easy and quick to assemble (minimal assembly required). 1 ✓ Some people liked the quality and said it was easy assembly of table. ✘ Some people said there were scratches on the table. Contemporary style meets class and elegance in the stunning Counter Height Dining Table. The 47 inch fixed oak veneer square tabletop is sophisticatedly graced with quartered book-match walnut inlay veneers and a perfect burnished finish. One of the best from Edward collection. Square shaped table (also available in rectangular table top). Highly burnished finish with quartered book match walnut inlay veneers. 47 inch fixed oak veneer table top. Stylish four paneled table base. 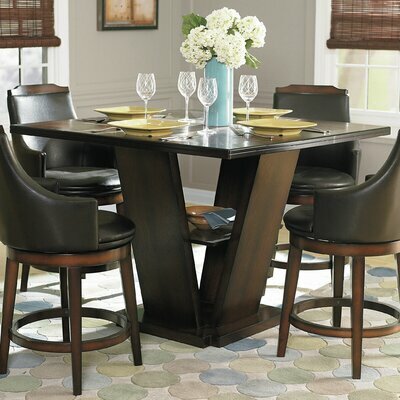 Compliment the table with comfortable dark brown bi-cast vinyl bar stools (sold separately). 1 ✓ Some people liked the table construction. ✘ Some customers think the table top was not very smooth. 2 ✓ Many people are satisfied by its look and quality. 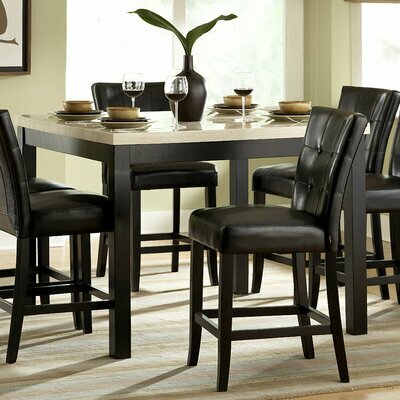 Endurance, durability and elegant contemporary style combine in Chloe 5 Piece Counter Height Dining Set. This irresistible stylish counter height table features an off-white marble table top with rich cherry finish storage base. 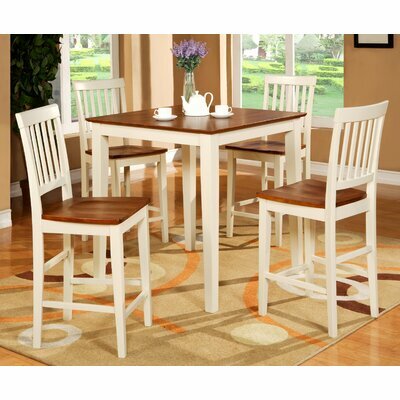 Stylish Chloe 5 Piece Counter Height Dining collection. Deep black finish table with storage base. Strong and aesthetically pleasing tongue and groove joints. Corner-blocking to ensure stability and endurance. Manufacturer provides one year limited warranty. 1 ✓ Some people have liked the chairs. ✘ Some people didn't like the quality. As the dining table assembly may vary for different tables. Here is a video which may be helpful to give you an idea on how to assemble the dining table. The number of people who gave positive feedback for square dining tables. Make sure you select the right size of the square dining table. The dining table sizes are specified by merchants, so it is good to take your time to check these carefully. In wooden furniture; there are so many kinds of wood. It is better to do some search about wood types if you don’t know much about. For example difference between Teak and Mahogany wood article would be helpful in understanding. Comparing the design whether it would match your room decoration would be another thing to consider and for this; there are various square dining tables available in different finishes to select.